Trunyan is another ancient village inhabited by people who call themselves the “Bali Aga” or old Bali who live in ways that are vastly different from other Balinese. The Bali Aga’s temple in this village is named Puser Jagat, meaning Navel of the Universe. Its architecture is highly unusual, and stands in the protective shade of a massive banyan tree. 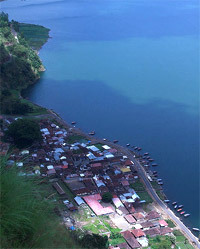 The village of Trunyan is squeezed tightly between the lake and the outer crater rim of Batur, an almighty volcano in Kintamani. This is a Bali Aga village, inhabited by descendants of the original Balinese, the people who predate the arrival of the Hindu Majapahit kingdom in the 16th century. It is famous for the Pura Pancering Jagat temple, but unfortunately visitors are not allowed inside. There is also a couple of traditional Bali Aga-style dwellings, and a large banyan tree, which is said to be more than 1,100 years old. At Kuban sub-village close to Trunyan is a mysterious cemetery that is separated by the lake and accessible only by boat, there is no path along the steep walls of the crater rim. Legend has it the village was established on the spot where an ancient taru menyan tree stood-thus the town’s name. It is said that in ancient times the lake goddess Dewi Danu was lured down from heaven by the lovely scent of this tree. The taru menyan is the lair of underworld spirits distracted only by corpses, which may explain the people’s practice of neither burying nor cremating the dead. Today Trunyan is a real tourist trap, and you may not get to experience much more than villagers clamoring for money. Still, the setting is spectacular-green mountain backdrop and deep blue lake, mist-shrouded Gunung Batur rising up dramatically on the other side. A path from Trunyan zigzags up the inside face of the crater wall on the southeast slope of Gunung Abang. Unlike the Balinese people, Trunyan people do not cremate or bury their dead, but just lay them out in bamboo cages to decompose, although strangely there is no stench. 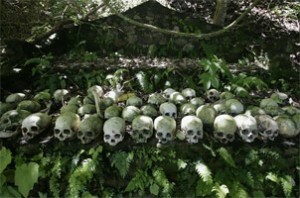 A macabre collection of skulls and bones lies on the stone platform and the surrounding areas. The dead bodies don’t produce bad smells because of the perfumed scents from a huge Taru Menyan tree growing nearby. Taru means ‘tree’ and Menyan means ‘nice smell’. The name of Trunyan was also derived from these two words. The women from Trunyan are prohibited from going to the cemetery when a dead body is carried there. This follows the deeply rooted belief that if a woman comes to the cemetery while a corpse is being carried there, there will be a disaster in the village, for example a landslide or a volcanic eruption. Such events have been frequent in the village’s history, but whether women had anything to do with it is a matter of opinion.